I have been slacking and haven't been posting daily as I should be. 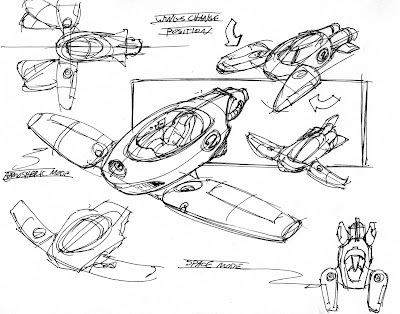 Here is a thumbnail page of an idea that I had for a ship with wings that would change position based on whether or not flight was taking place on a planet with atmosphere or in open space. I really like this idea, I hope I can do more with it. Once again if you have any ideas that you would want to see me sketch, leave it in the comments. Thanks. You should do movie conceptual design. The wing transition would be very "cinematic". Dude, I like this one. What a great idea.